Currently only 40 percent of apartments in CA for rent have a recycling program in place. Ecology Action, a local nonprofit company has been working to change that. So far they have helped hundreds of complexes set up programs over the past 4 years. The University of California’s goal is to divert 75 percent of waste from the landfill by 2012 and more than 90 percent by 2020. The campus is close to 60 percent thanks to help given by Ecology Action according to http://www.santacruzsentinel.com/business/ci_18209953. “Ecology Action has been working very hard to help UCSC to reach those goals,” said Roger Edberg, of UCSC grounds services, citing contributions of materials, equipment and staff time. Recycling can pose a problem at apartments in CA for rent where buildings were not designed with recycling in mind. Ecology Action deals with this by putting recycle bins wherever there is a trash bin. 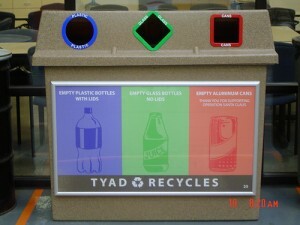 Each bin has a photo of what goes in that particular one such as glass, cans, or paper. It is working so well for one apartment complex that the manager is considering putting in a compost bin! How about you? Any luck finding apartments in CA for rent? Comment below.